McNICHOLS strives to be a business that customers trust. The Better Business Bureau (BBB) seal of approval gives our customers confidence regarding our trustworthiness in the marketplace. The BBB standards address ethical business behavior, strong relationships with customers, and other high merits. BBB provides verified, unbiased information about our Accredited Business. 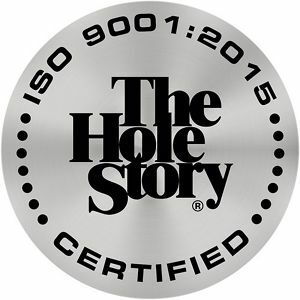 McNICHOLS BBB A+ rating ties in directly with our mission of Service, Quality and Performance … That's The Hole Story®! The McNICHOLS website is secured by DigiCert, a high-assurance SSL certificate provider. The DigiCert seal signifies that DigiCert has verified the authenticity of a secure McNICHOLS website, further boosting customer confidence and security. McNICHOLS strives to meet the highest levels of quality, customer service, and safety. Our ISO 9001:2015 certification attests to our adherence to our quality management system. The standard—developed by the International Organization for Standardization—addresses customer focus, motivation of management, the process approach, continuous improvement, and other requirements. McNICHOLS maintains a Quality Manual and accompanying documents to comply with the standard and has implemented a Quality Management System. McNICHOLS has been a member of Metals Service Center Institute (MSCI) since the 1960s. Between 2000 and 2002, Chairman and CEO Gene McNichols served a two-year term as chairman. President Scott McNichols served on the nonprofit trade association's national board of directors from 2015 to 2018. Founded in 1909, MSCI serves the industrial metals industry from its headquarters in Rolling Meadows, IL. MSCI has approximately 400 members operating from roughly 2,500 locations in North America and abroad. McNICHOLS ensures the safety of our online customers through the security services provided by Trustwave. They provide our business with threat management, vulnerability management, data protection, and compliance management. Trustwave is our partner in fighting cybercrime, helping to ensure our customers enjoy a secure online experience while exploring the pages of mcnichols.com.